NYC. It probably doesn’t come as a surprise that one of my favorite s/s 13 trends is stripes. After searching through the jungle of over-ambitiously striped blazers that leave you with a slight feeling of vertigo, this one really caught my eye. Love the clean lines & the subtle bling of rhinestones scattered over the stripes! BLAZER Nanette Lepore. CASHMERE SWEATER Uniqlo. SUNGLASSES Céline. JEANS J Brand. BAG Proenza Schouler ps1. SHOES Stuart Weitzman. This entry was posted in Outfit and tagged Celine, j brand, Nanette Lepore, Proenza Schouler, stuart weitzman, uniqlo by Carolina Engman. Bookmark the permalink. I am pretty obsessed with stripes as well, the blazer is gorgeous, love the subtle striped detail! your blazer is so beautiful, I love it!!! love your style!!! love your outfit, that blazer is gorgeous! You look gorgeous! Love your blazer! Beautiful outfit, really love your blazer and slippers! So great photos. Stripes trend is one of my fav trend for this season too. You look amazing! very nice blazer!! i love this otufit because it seems to be really comfy, easy but so stylish as well!! Great black and withe outfit! Perfect casual look. Love the bag. Great look! love the blazer. Great blazer. It suits you so well. Gorgeous, love the blazer and the loafers. Today I’m also wearing a striped shirt…a B&W outfit with special accesories. Love the pictures and the blazer!! I have to agree, this blazer is very clean, simple and classy! The blazer is really nice! You look great! I love your pictures! The blazer is so stunning! I love it’s color and the way you wear it! Such a clean and crisp blazer. Great find!! Beautiful! What a unique blazer, and I’m loving the loafers. I love this look, the shoes are really cool, they’re kind of holographic, awesome! Very nice blazer and shoes. You look so natural and confy in that photoshoot. Your bag and shoes! So fab! The stripes goes well with the all black ensemble. Great outfit! Gorgeous blazer. I love that the stripes are a feature rather than all over. love love your blazer! the strips works perfectly! Love the striped blazer. Such a bold and cute look. Beautiful blazer… the whole black and white look is very chic! Beautiful and chic, love the stripes! The shooes are so amazingg! What a lovely outfit! Great show as well! Original and different blazer which makes your looks amazing! That blazer is really amazing! And we love de sunglasses too! I just love that blazer !! 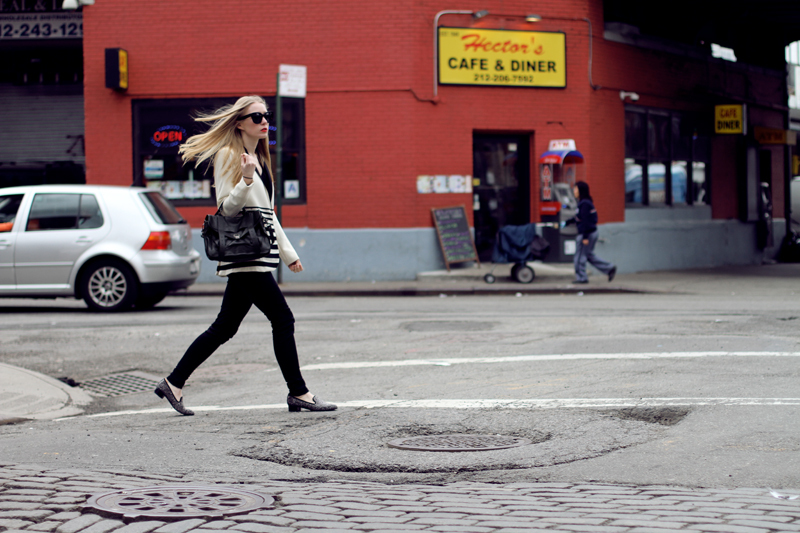 Great look… you are always impeccably styled! those shoes are beautiful, nice! Love this blazer!! It’s so unique. Great post. Love the look! What an amazing blazer. And the fit is so modern and sleek. Looks great on you! you look wonderful in stripes! I Love your Outfit, that Blazer is amazing. Perfect Outfit for here in nyc. I don’t even know what to say! This outfit is just so stunning. LOVE the blazer and those shoes are to die for. Plus, I’m loving the pop of colour on the lips, such a nice touch to the monochrome outfit. Hey! Its different bt nice…loved your outfir like always. Beautiful outfit :) I love especially your bag ! Love this look! 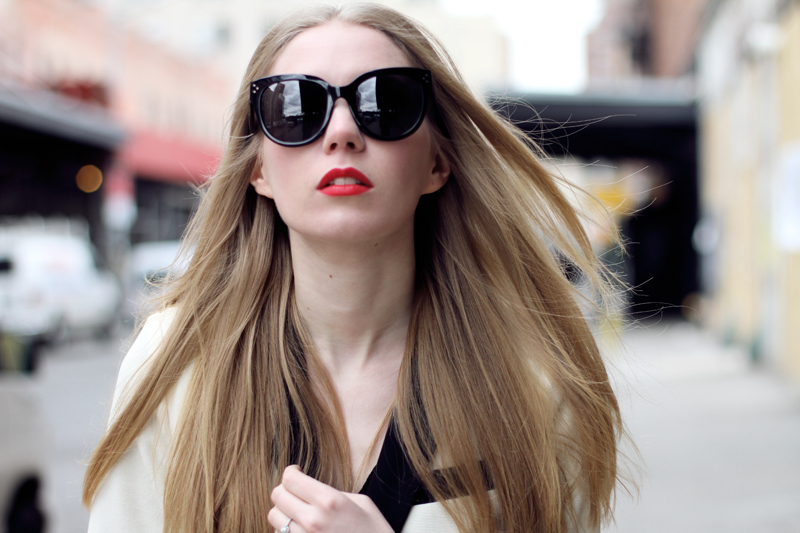 And red lips and Celine sunnies are the perfect match! Cool blazer, I love it! Love this black and white combo !!! You look cute! Amazing shoes! What a lovely blazer. I think I need one. great comfy outfit! the coat is really cute! Gorgeous look, your shoes are great! I love your blazer, its so pretty! Those are my favorite walking shoes. Very, very nice and you are so so pretty!!! lovely! i love those shoes! Love your shoes & bag. I love the bag and shoes. Amazing ! You look great! Cute blazer! I love everything haha. It’s a really great combination! Stripes and black and white! 2 favourite trends for summer!